Home CDN , children , crafts , feature , holiday , holidays , homeschool , March , papercrafts , printables , US , worldwide March 21st - Featuring Fairy Freebies! -- Calling all fairies, elves, gnomes, pixies, sprites, brownies, leprechauns, dragons and other magical and mystical creatures to join us for a day filled with wonder and enchantment. We also invite the human friends of the fae to come play for a day! -- Fairies of the water, air, and earth, the trees and flowers, the house and hearth: all these mysterious, elusive creatures materialize on the pages of this distinctively beautiful guide to fairyland. Illustrated throughout with captivating artwork in glorious color, it examines fairy legend and lore through the ages and leads us into fairy cities, landscapes, rings, and paths. Find out what clothes they wear (fairies can be fussy about their dress), what they like to eat and drink, and what plants and animals they cherish. Discover the secrets of fairy festivals, and the various names they like to be called — including the Little Folk and Good Neighbors. Altogether, it is a privileged glimpse into a paradise that vibrates at a different frequency than ours... and few can ever see. • Mystic Garden Fairy Garden Kit -- The Mystic Garden fairy garden kit will help you build a magical fairy world of your own. Quality handpainted resin garden fairy figurines, furniture and tea set including Believe fairy house. Gardening gets the kids outside to play; interest them in planting and growing a tiny pretend paradise. 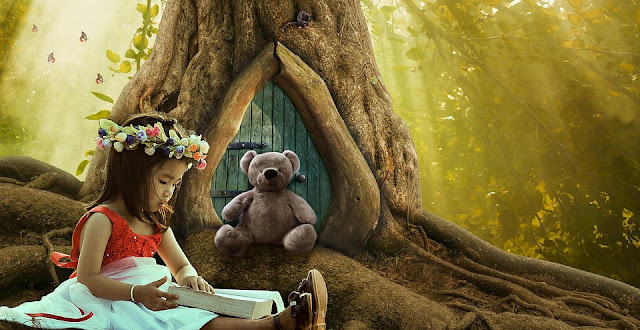 • My Fairy Doorways -- Jump into a magical world with the award-winning My Fairy Doorways Woodland Fairy Door! Meet Sophia the Woodland Fairy in the included collectable storybook and interact with your child's imagination by sending letters through the enchanted mailbox! Decorate and personalize the fairy door with cute decals and pixie dust. Your child will look forward to interacting with their magical fairy friend and it will make a beautiful memory and keepsake! This kit is suggested for honorary fairies ages four and up. - Celebrates those long, airy loaves with the thin, crispy crust. The French don't actually call them French bread, of course. Their term for their country's signature baked good is baguette. - Children's poetry reminds us of our own childhood, but aside from the nostalgia, it reminds us of how fun song and rhyme can be to tell a story. Teach your child a new poem on Children's Poetry Day! - They are sullen, moody and always seeming to find the drama in situations. But why shouldn't they have their own holiday? So let your teens run wild, just for one day. No nagging, no screaming. Let him sleep until two in the afternoon. Let her text her friends all day long - even through dinner. But remember, it's ONE DAY ONLY! Normal house rules are back in order at 12:01 on Tuesday. - An annual observance/holiday celebrated by astrologers and astrology enthusiasts. It is seen by astrologers as the beginning (first day) of the astrological year. - A day set aside to honor and applaud the hard work single parents do each and every day in raising their children. It is a day for honoring the single parent who is basically doing double duty and giving them some respect. - As a society, doesn't it seem courtesy and manners sometimes take a back seat? The world is seemingly full of loud voices on cell phones in all sorts of public venues, line jumpers at business and social events, drivers acting by their own rules. - This day is about cologne, perfume and all the things that are good-smelling. That even includes potpourri, soaps, lotions and even scented candles. Perfume is a mixture of fragrant essential oils and aroma compounds, fixatives, and solvents used to give the human body, objects, and living spaces a pleasant smell. Women love to wear perfume and men love to smell it on women. Women love to smell cologne on a man as well. - National Flowers are a symbol of the representing country. Some national flowers have cultural or religious roots go back hundreds or even thousands of years and may or may not have been officially adopted. Others have been adopted only in recent years as a result of growing environmental consciousness. In any case, flowers are found to have assumed a significant importance not just in the lives of some persons but the whole nations and in fact, the whole world. - Initiated by the United Nations General Assembly in 1966 to be observed annually on March 21st, the anniversary of the killing of 69 African demonstrators at Sharpeville, South Africa, in 1960, as a day to remember the victims of Sharpeville and those countless others in different parts of the world who have fallen victim to racial injustice and to promote efforts to eradicate racial discrimination worldwide. - The aims of World Down Syndrome Day are to promote awareness and understanding, seek international support, and to achieve dignity, equal rights and a better life for people with Down syndrome everywhere. This date (21/3) represents the three copies of chromosome 21, which is unique to people with Down syndrome. - A day designated by some churches to recognize the importance of interracial relations. It is an opportunity to affirm the value of all our different languages, beliefs and cultures, and our common belonging to a unique and diverse nation.